Saccharomyces Cerevisiae Cell Wall (Yeast Immunopolysacchride)-Saccharomyces Cerevisiae Cell Wall (Yeast Immunopolysacchride)-Animal nutrition-Products and services-Shandong SunKeen Biological Engineering Co., Ltd.
Sunkeen Saccharomyces cerevisiae cell wall (yeast immunopolysacchride) is a type of concentrated or dried cell wall product obtained through autocytolysis, enzymolysis, and separation of the raw material - fresh yeast. Abundant in biological immune factors including β-glucan and mannan oligosaccharides, it is an efficient, nutrient, and safety new immuno-enhancer for animals. 1) Derived from yeasts, it is a kind of natural immuno-enhancer free of resistance to drugs, residual, and adverse effect. It is safe for long-term use. 2) It abounds in efficacious components as β-1, 3/1, 6-glucan, mannan oligosaccharides, and chitinous substance and it is equipped with spatial structure identifiable by immuno-receptor. It is characterized by good stability to meet the requirements of processes like pelleting and puffing. 4) Strict raw material control and advanced extraction process contribute to the stable and first-rate product quality. 1 It will remarkably help the growth and development of immune organs of poult, enhance their disease resistance and anti-stress capabilities, and reduce their cull-and-death rate. 2 It will quickly enhance the active immunity of weaned piglets, reduce stress caused by weaning, increase survival rate, and decrease diarrhea rate, so as to effectively prevent early weaning syndrome of piglets. 3 It strengthens reproduction performance of sows by reducing the rates of abortion and stillbirths. It will help increase the contents of antibodies in colostrum and improve the immunity level of piglets. 4 It will increase the feed intake, decrease feed coefficient, and improve production performance of animals. 5 It can absorb pathogenic bacteria in the intestines, aflatoxin released by chelate gastrointestinal tract, and integrate with zeranol in corn. 1 It will enhance the hematopoietic function of the livestock and poultry and perfect their figure and fur. 2 It will enhance immunity of calves and lambs and increase the level of immunoglobulin in the blood serum. 3 It will increase milk yield of cows, prolong their lactation period, and raise butter-fat content. 4 It will prohibit increase of pathogenic bacteria in intestines, improve immunity and anti-stress capability of cows, and prevent occurrence of mammitis. 1 It will boost development of immune organs of fish and stimulate the increase of T and B lymphocytes. 2 It enhances the disease resistance and anti-stress capabilities of such aquatic animals as fish, prawns, and sea cucumbers. 3 It will boost the growth and ingestion of aquatic animals and increase the feed conversion rate and weight gain rate of fish. 4 It will remarkably improve the activity of superoxide dismutase and lysozyme as well as the level of complement C3 in fish and prawns. 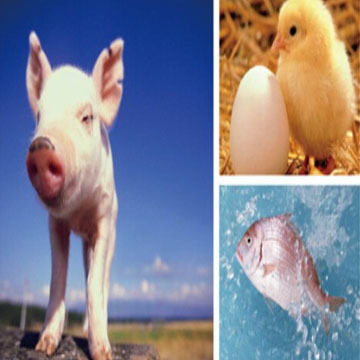 It is applicable to breeding of all kinds of livestock, poultry, and aquatic animals to improve their immunity. Please store in cool and dry places and use immediately upon unpacking. Pack securely after use to prevent moisture.